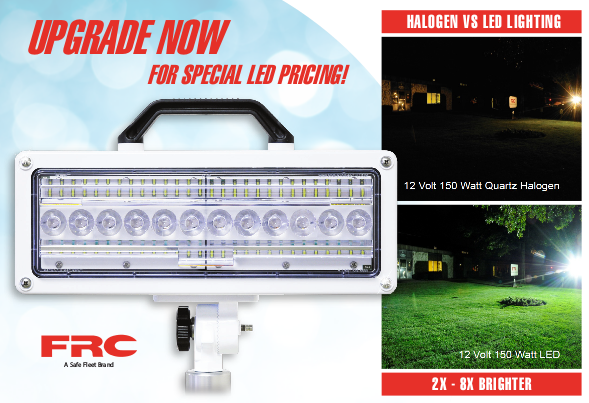 FRC | News » Archive » LED Upgrade Offer extended for 2019! LED Upgrade Offer extended for 2019! Upgrade now for special LED pricing! Call your dealer now with your current FRC model number to be replaced. Easy to order – your dealer has been sent a cross-over chart. Drop-in replacement – some change-outs require additional hardware which is provided in the kit. Use existing wiring – swap out the lamps and leave the wiring in place. Use less power – LEDs are much more efficient. No maintenance – LEDs will generally last the lifetime of the vehicle without requiring new bulbs. This offer is for a limited time. Call your local dealer or service facility today! for special retrofit program pricing!